B1B70, B1B71 code - Each front sensor is secured with a screw to the block of the front end module carrier on either side of the cooling module and inboard of the headlamp within the engine compartment. Impact sensors perform their own self using power supplied by the Occupant Restraint Controller (ORC) then comminacate this status back to the module. The repair of this fault centers on verifying the integrity of the sensor's internal circuitry and software validity. If the scan tool shows this DTC has a stored history of setting then the front left/front right impact sensor is to be replaced. When monitored this DTC with the ignition on, the front left/right impact sensor is equipped with on board diagnostics to monitor to sensors internal circuits. If probelm is identified, the sensor sends the front left/right impact sensor internal message to the Occupant Restraint Controller (ORC). This DTC will set if the ORC receives an internal DTC from the front left impact sensor. If the scan tool shows this DTC has a stored history of setting then the front left/right impact sensor is to be replaced. Make sure the battery is fully charged. Turn the ignition on, wait one minute and read active codes. Is DTC B1B70/B1B70 active or shows a setting history in stored? Yes, turn the ignition off disconnect the 12 volt battery and wait two minutes before proceeding. Inspect the related wiring harness for chafed, pierced, pinched, and partially broken wires. Also, inspect the related connectors for broken, bent, pushed out, spread, corroded, or contaminated terminals. Repair as necessary. Go to step 2. No, did not set a active or stored DTC B1B70/B1B71 code. Go to step 3. Turn the ignition off, disconnect the 12 volt battery and wait two minutes before proceeding. Replace the front left/right impact sensor. Remove any special tools or jumper wires and reconnect all previously disconnected components - except the battery. Turn the ignition on, then reconnect the 12 volt battery and wait two minutes before proceeding. Use the scan tool and erase the stored codes in all airbag system modules. Turn the ignition off, and wait 15 seconds before turning the ignition on. Wait one minute, and read active codes. Did the active DTC B1B70/B1B71 code? Yes, turn the ignition off, disconnect the 12 volt battery and wait two minutes before proceeding. If the Occupant Restraint Controller (ORC) is dropped at any time, it must be replaced. Failure to follow these instructions may result in possible serious or fatal injury. Replace the ORC module, perform the Airbag system verification. With the scan tool, record and erase all DTC from all airbag modules. 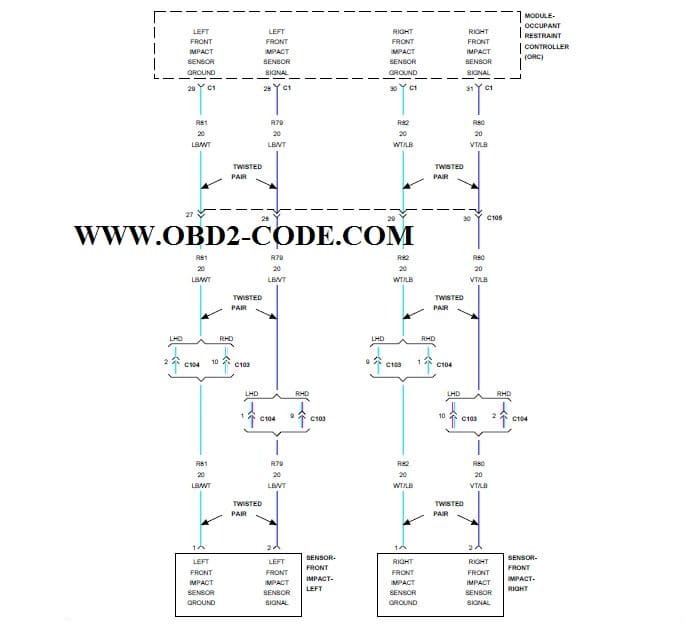 If any active codes are present they must be resolved before diagnosing any stored codes. Turn the ignition off, disconnect the 12 volt battery and wait two minutes before proceeding. 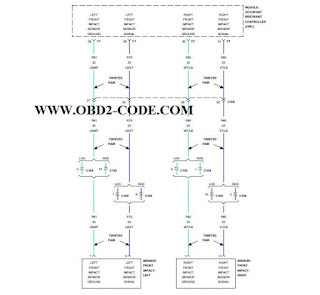 Using the wiring diagram/schematic as a guide, inspect the wiring and connectors. Look for chafed, pierced, pinched, or partially broken wires and broken, bent, pushed out, spread, corroded, or contaminated terminals. the following additional checks may assist you in identifying a possible intermittent problem. Reconnect any disconnected components and harness connector. With the scan tool, monitor active codes as you work through the following steps. Maintain a safe distance from all airbags while performing the following steps. Failure to follow these instructions may result in possible serious or fatal injury. Wiggle the wiring harness and connectors of the related airbag circuit or component. If codes are related to the driver airbag circuits, rotate the steering wheel from stop to stop. If only stored codes return continue the test until the problem area has been isolated. In the previous steps you have attempted to recreate the conditions reponsible for setting active DTC in question. Are any ACTIVE DTCs present or is the impact sensor showing stored DTC status? Yes, if the scan tool shows this DTC has a stored history of setting then the front left/right impact sensor is to be replaced. No, no problem found at this time. Erase all codes before returning vehicle to customer. 0 Response to "B1B70, B1B71 Up Front Left/Front Right Satelite Acceleration Sensor Internal"